Heat oven to 375°F. Spray cookie sheet with cooking spray. Place French bread on cookie sheet. Bake 23 to 25 minutes or until golden brown. Meanwhile, in 10-inch nonstick skillet, cook beef over medium heat 8 to 10 minutes, stirring occasionally, until brown; drain. Stir in Worcestershire sauce and seasoned salt. Use serrated knife to cut deep V-shape in top of French loaf. Remove V-shape piece of bread. Hollow out center of loaf with spoon. 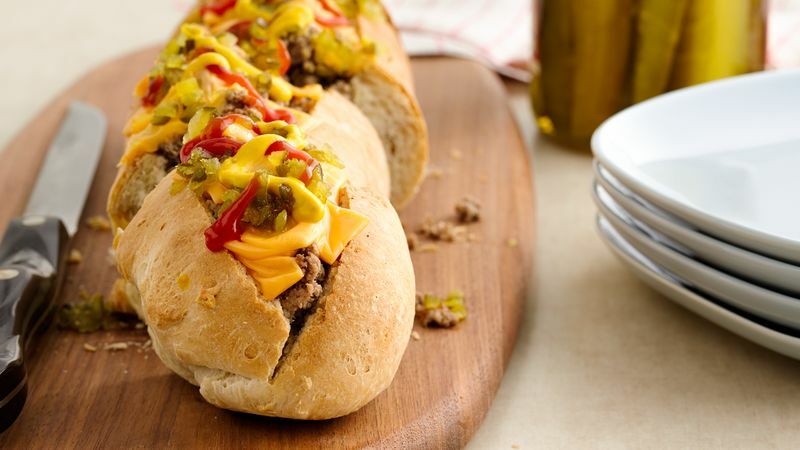 Spoon beef mixture into hollowed-out French loaf. Top with cheese pieces. Bake 3 to 5 minutes longer to melt cheese. Top with remaining ingredients. Cut into pieces to serve. Use ground turkey or ground chicken in place of the beef.